The pre-war apartment buildings of New York City are particularly effective at retaining heat. When it cools off outside even slightly, the temperature on the higher floors can still remain sweltering. In a kitchen without air conditioning, the heat makes the entire enterprise of cooking uncomfortable, if not unbearable. Pasta with an uncooked sauce offers a more tolerable culinary option. Beyond boiling the water, no cooking over a hot stove is required, and the final product has the freshness of a salad. The following technique is a middle ground between Lidia Bastianich’s recipe for Salsa Cruda (Lidia’s Italian Table) and Giuliano Hazan’s recipe for Orecchiette al Pomodoro e Ricotta Salata (Every Night Italian). 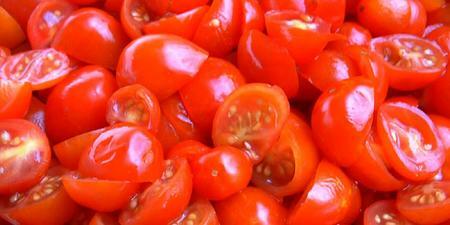 It leans towards Lidia’s uncooked recipe, which utilizes cherry tomatoes. The tiny tomatoes almost always seem to be ripe, so they are the perfect alternative to the hard, flavorless, pre-season tomatoes that are often the only ones available. Moving away from Lidia’s recipe, this sauce incorporates ricotta salata, the firm, salty, dried ricotta cheese that is called for in Giuliano’s recipe. To make the pasta, take about four cups of small cherry or grape tomatoes, slice them in half, and let them macerate in a bowl with extra virgin olive oil, salt, pepper, and red pepper flakes. After about 20 minutes, the tomatoes will have released some of their juices. Boil water and cook the orecchiette, the small pasta shaped like ears, until al dente. Though any shape of pasta may be used, the orecchiette are perfectly matched in size to the tomatoes, and their cup-like shape and ridged exterior does a good job of holding the chunky sauce. When the pasta is done cooking, drain and combine with the tomatoes, julienned basil leaves, and crumbled ricotta salata. If the sauce is too dry, add some of the pasta cooking water and some additional olive oil, toss together, and serve.